Nsit Atai town is a sundry traders town. The town lies at the south east part of the country. 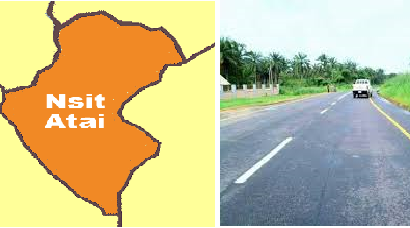 Nsit Atai town is 50km drive to Uyo the state capital. It’s is a local government area which has headquarters in Odot town. The town is among the North-East Senatorial zone in Akwa ibom state. It’s shares common boundary with Ibesikpo Asutan at the West. Also, it is closer to Okobo from the East and Uruan at the North. Nsit Atai town has up to 10 wards with Councillors each. The chairman is the head of the council. The town came into existence during the reign; of President Ibrahim Babangida. Nsit atai town indeed is a rising LGA with energetic youths. The town had a population of 37,318 male occupants and 74,595 females. This result to a 101,915 total occupant according to 2006 population. Nsit Atai town was form In 1996 . Today the population will be more compare to the former. There are 62 villages in the town. The Paramount Ruler is HRH Edidem Akpan Udofia Ntuen. Also the Executive Chairman is Hon. Emem Ibanga. The people of this town are Ibibio. Unlike ABIAKPO TOWN. The people in this town likes the Eko-ong Utah traditional dance. They also have Ekpo, Egre, Ekong and other traditional activities.The town is a mix town. They have Christians and traditional worshippers here. Nsit Atai speaks Ibibio, some speak other Akwa ibom language. Yet, the land accommodate people from different places in country. So there are other languages like English, Pidgin English, Hausa, Igbo and Yoruba. The town is a nice and busy environment with activities. The town has 4 major health centres. A comprehensive health care center. 2 health post and 1 primary health center. There are adequate equipment and facilities in the centres. Also the health personnels are active. Nsit Atai town has embrace education . But needs to work on it standard. The town administrators has set up 13 nursery schools. Alongside with 25 primary schools. There are 9 secondary schools in the LGA. The town also made provision for 26 adult education. The town is a fertile ground. There is crude oil deposit, salt and clay in high quality. There are different palm produce. The town also have high quantity of Plantain and Palm oil. Timber and wildlife exist here. The rate of Agricultural activities is very high. Expertise advice the labour need to be reduce. This include crude oil deposits, commercial quantity of salt and high quality clay. Agricultural resources include plantain oil palm and palm produce. Preponderance of hard wood, timber and wild life. Agriculture provides employment and means of livelihood to the people of Nsit Atai. The land is generally fertile but the fertility rate is very low. This is due to continuous activities which results in low productivity. Its also lead to income and low standard of living. This is a good place for investment.